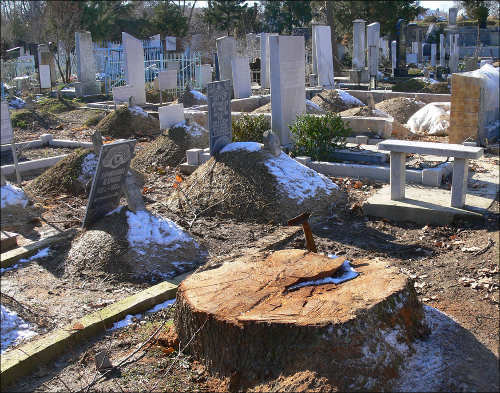 The Uzbek woodcutter finally reached the graveyards: the perennial trees are being cut down at Minor Muslim graveyard in Tashkent. The first clearance took place last winter – shortly after total slash of trees at the prominent Tashkent Boulevard and sesquicentennial chenars near Shark publishing house and Uzbekistan hotel. The workers were hurriedly sawing down many big trees, making no secret that they will be supplied to the furniture plant. They also informed that as the payment for their work, the woodcutter will receive branchwood they were going to sell as the brushwood. 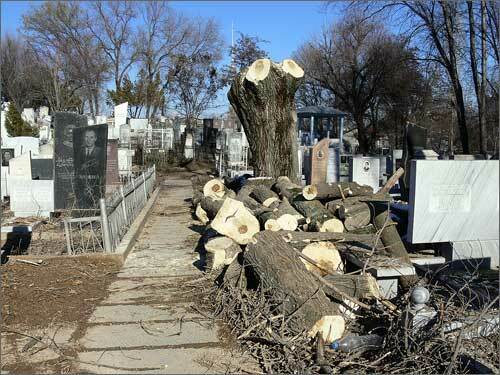 In the last few weeks the trees at the Minor graveyard were cleared again. It is interesting to note that the cut down trees are not only massive and shady trees, the commercial timber, but also plane tree, oak and elm. The fruit trees and other, not having high commercial value, are not hunted. It has to be mentioned that the Minor graveyard is considered as elite Muslim burial ground in Tashkent. The relatives of famous Russian oligarch Alisher Usmanov, Uzbek barons Gafur Rakhimov and Salim Abduvaliev and many other state figures, scientists, writers and poets are buried here. Obviously, without the authorization from highest authorities no woodcutter would be allowed there. The lumbermen pay no fees or penalties, whatsoever. "For some people the elimination of plants, unfortunately, became the source of unfair income. In order to cut down the tree in the city, one needs the authorization from Tashkent committee for environmental protection. 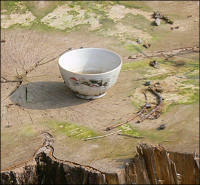 It indicates the type of tree, diameter and cost of clearance. Thus, the cut down of acacia, maple or poplar with the diameter of 40 centimeters will cost over 49 thousand sum ($1=2250 at "black market" rate). The cutoff of more valuable types, such as chenar, oak and black locust with the diameter of over 40 centimeters will cost 74 thousand sums. The illegal cutoff of one plane tree or ash is estimated at 496 800 sum for legal entity and 248 400 for individual… Any breaker is brought to trial if the damage size reaches at least 100 minimum salaries. All information is sent to Prosecutor General’s Office and the criminal case in filed". According to Mustafin, the woodcutters cut the trees by the order of certain people that make high profits on expensive wood. Unfortunately, Mustafin did not name them in his interview. On the other hand, unofficial source report that Uzbek Prime-Minister Shavkat Mirziyaev owns the furniture, and parquet in particular, factory. It may seem that the slash of the Tashkent Boulevard was ideologically motivated by granting access to luxury Forum Palace and equestrian statue of Amir Timur. However, during the clearance process the energetic Prime-Minister visited the site on the daily basis, controlling not only the cutoff of perennial trees, but also their transpiration. However, even Shavkat Mirziyaev could not give his personal authorization to cut down the trees everywhere. According to some sources, there is some document, legalizing the full clearance of the chenars across the republic. For instance, Ozodlik (Uzbek service of RFE/RL) radio informed on January 11: "The inquiries of the mass clearance of plane trees in big cities of Uzbekistan should be addressed to Ministers Council. In any case, commenting on the slash of trees in Samarqand, the representative of local authorities Shukhrat Mardonov said that "there was an appropriate protocol of Ministers Council". It looks like there is some secret governmental document. One of the Samarqand said that the chenars were cut down "by the decree of Khokim", mentioning that "The chenars were planted in Samarqand 80 years ago. They were going to stand there 1000 years. At the moment most of the plane trees have been slashed. Nobody knows where chenars are transported". The radio program assumes that the officials, having certain governmental authorization, sell the chenars. One of the persons, well aware of construction materials market in Tashkent, says that chenar parquet is demanded by wealthy people. Since nobody in Uzbekistan has enough authority to order the slash of chenars throughout the country, one can assume that the President of Uzbekistan supported this move. Six years ago Islam Karimov mentioned that chenars were poisonous and it would be great to get rid of them. The ecologists shared that his wife was allergic to plane trees and Karimov could order to eliminate them, including sesquicentennial ones in the downtown Tashkent. The shared vision of two great personalities (Great mastermind and Great Manager) is obvious.